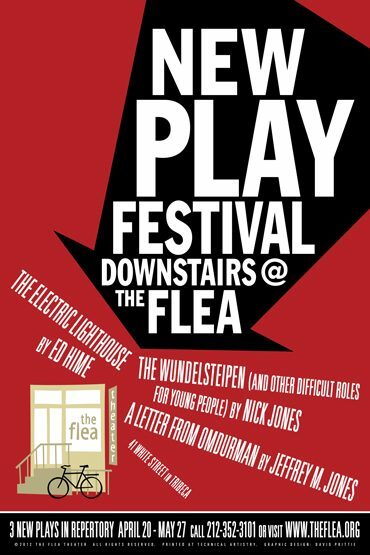 As part of the NEW PLAY FESTIVAL, The Flea Theater is proud to present the world premiere of THE WUNDELSTEIPEN (and Other Difficult Roles for Young People) by Nick Jones and directed by Flea Resident Director Tom Costello. THE WUNDELSTEIPEN (and Other Difficult Roles for Young People) is an evening of dark comedic pieces which are nasty, brutal, and short. The production features members of the Flea’s acclaimed resident acting ensemble, The Bats: Hannah Corrigan, Tommy Crawford, Eric Folks, Alex Herrald, Maren Langdon, Sean McIntyre, Tedra Millan, Briana Pozner, Donaldo Prescod, and Dominic Spillane. The design team includes Kate Foster (Set), Jonathan Cottle (Lights), Stowe Nelson (Sound), Nicole Wee (Costumes), Robin Frohardt (Puppets), Alison Beatty (Choreographer) and Laura Been (Stage Manager). Original music by Corn Mo. Nick Jones produced plays include: The Coward (Lincoln Center/LCT3; 4 Lortel Nominations, including “Best Play”) Jollyship the Whiz-Bang (Ars Nova, The Public), Straight Up Vampire: The History of Vampires in Colonial Pennsylvania as Performed to the Music of Paula Abdul, The Sporting Life, and The Nosemaker’s Apprentice (with Rachel Shukert). His puppet horror musical Homunculus is in development with Center Theater Group (music by Dave Malloy, directed by Sam Gold) and Grizzly Adams, a rock musical performed by bears, with the Huntington (music by Corn Mo, directed by Peter Dubois). He also holds commissions from the Old Globe and Lincoln Center. The Coward is being developed into a film with Big Beach Films/American Work. This spring, he begins work as a staff writer on Orange is the New Black, for Netflix. His play Trevor is being produced by Circle X Theater in Los Angeles, in the fall. He attended Bard College for Literature and Juilliard for playwriting. Tom Costello (Flea Resident Director) has been a freelance director in New York City since receiving his BFA in Drama from NYU/Tisch. He has recently directed Pipeline Theatre Company’s productions Sleepless City by Tim Chawaga, Shakespeare the Dead by Alex Mills (Dream Up Festival) and Bubble and Squeak by Evan Twohy, which was a finalist in the 2011 Samuel French Off-Off Broadway Festival. He has also directed numerous productions for Atlantic Acting School where he is also a faculty member. This summer, he assistant directed on Bluebird by Simon Stephens at the Atlantic Theater Company and has served as Associate Artistic Director for Babel Theatre Project.